"The music reaches the correct frequency only at certain times, for example, when there is a strong bass component," he said. "The acoustic energy from the music can pass through body tissue, causing the cantilever to vibrate." "You would only need to do this for a couple of minutes every hour or so to monitor either blood pressure or pressure of urine in the bladder," Ziaie said. "It doesn't take long to do the measurement." "This paper demonstrates the feasibility of the concept," he said. The device is an example of a microelectromechanical system, or MEMS, and was created in the Birck Nanotechnology Center at the university's Discovery Park. The cantilever beam is made from a ceramic material called lead zirconate titanate, or PZT, which is piezoelectric, meaning it generates electricity when compressed. The sensor is about 2 centimeters long. Researchers tested the device in a water-filled balloon. "But a plain tone is a very annoying sound," Ziaie said. "We thought it would be novel and also more aesthetically pleasing to use music." "Rap is the best because it contains a lot of low frequency sound, notably the bass," Ziaie said. 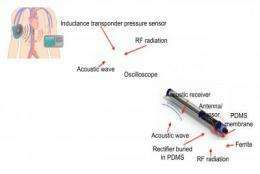 "A wireless implantable device could be inserted and left in place, allowing the patient to go home while the pressure is monitored," Ziaie said. Great, I can just see my doctor prescribing 4 hours of rap music every day, I'd rather kill myself.